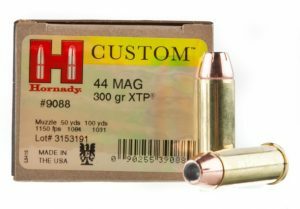 The .44 Magnum is a large bore cartridge that was first introduced in 1956. An accurate, deeply penetrating round, the .44 Mag was originally designed by Elmer Keith, an Idaho rancher, writer, and firearms enthusiast. Keith had previously developed the .357 Mag cartridge and solidified his reputation in the firearms community. Keith set out to create a multi-functional cartridge and convinced Smith & Wesson and Remington Arms Co. to manufacture it for the Smith and Wesson Model 29. Although Remington manufactured the first. 44 Magnum at Keith’s request, S&W is credited with introducing the .44 Mag to the public. 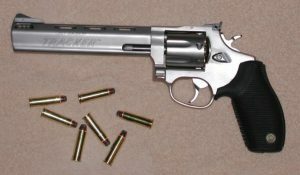 Not many people seem to remember that Ruger beat S&W to market by a few months with a .44 Mag version of its single action Blackhawk revolver. Keith had intended for the .44 to be used for hunting, self-defense, and target shooting. The cartridge is strong and packs a big punch. The .44 is extremely precise, giving the shooter as much as a 90% accuracy rate. However, the high-pressure causes it to carry a heavy recoil and muzzle flash, making it less than ideal for novice shooters or people of smaller stature. 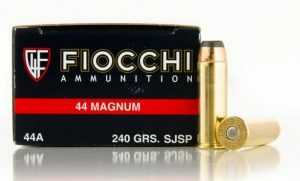 Those that find the .44 Mag a bit too intense may opt for the .44 Special, a slightly smaller cartridge with less recoil. Shooters should experiment using both rounds to find which is best suited to their style and experience. Note that .44 Special cartridges can be fired from guns chambered for a .44 Magnum, but the reverse is not true. While the .44 Magnum seems to be the perfect bullet for self-defense experts often rebut the choice due to its deep penetration. They claim that the cartridge is too powerful for in-home defense and may cause collateral damage. 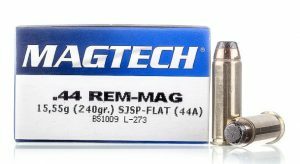 It’s important to keep in mind that not all .44 Mag ammo is the same. Some brands and grades are appropriate for self-defense while other, less powerful, grades are more appropriate for target and sports shooting. After the movie hit the theaters, Eastwood’s devotion to his S&W Model 29 and .44 Mag skyrocketed sales and kept the iconic weapon and cartridge at the top for decades. It’s hard to tell how many thousands have practiced that very line in front of the mirror. The .44 Mag is no longer the most powerful handgun in the world, but its popularity will live on forever. 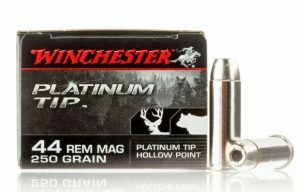 Top of the list of the best .44 ammo for self-defense. 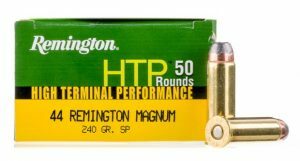 Available in 240 grain SP and SJHP rounds, this American-made self-defense cartridge is inexpensive, but powerful. It boasts 1180 FPS Muzzle Velocity and 742 ft lbs Muzzle Energy. Highly recommended by seasoned shooters, this American-made self-defense cartridge makes the list for the best .44 self-defense ammo. It’s slightly more expensive than the Remington, but also more powerful. It boasts 1150 FPS Muzzle Velocity. Coming in at the same price as the Remington, this foreign-made 240 grain self-defense ammo offers 1838 FPS velocity. A bit more expensive than the other brands, Winchester offers this American-made self-defense cartridge with 1250 FPS Muzzle Velocity. 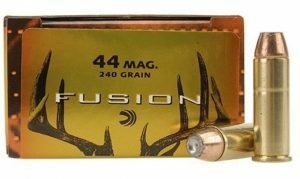 This medium-priced American-made Fusion bullet with brass casing delivers 887 ft lbs Muzzle Energy. Brazilian-based Magtech offers this SJSP bullet with brass casing, touting 1180 FPS Muzzle Velocity and 742 ft. lbs. Muzzle Energy. Remember, regardless of which cartridge you choose, nothing takes place of practice. A bullet won’t serve any purpose if it misses its target.